This unique region plays host to some of the most brutal and beautiful races in professional cycling. Think cobbles, mud, short steep climbs, flat lands, wind & exhilarating rain. Known for the Paris-Roubaix and Ronde Van Vlaanderen, this is the land of Belgian beers, frites & waffles. This is the land where the hard men of cycling triumph and iconic riders like Merckx prevail. 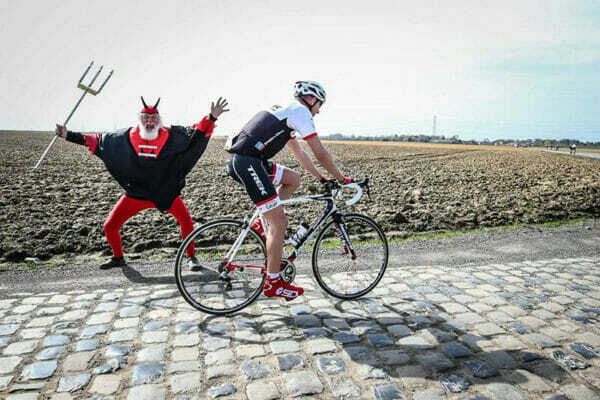 Join Eat Sleep Cycle for Roubaix or the Tour of Flanders – or why not enjoy both tours back to back? Carrefour de l’Arbre is a 2.1 km cobbled road in the Nord department of Northern France. The location was the setting of the Battle of Bouvines, which ended the Anglo-French War in 1214. However today, the road is best known from the cycling classic Paris-Roubaix, where it has often proved decisive due to its proximity to Roubaix and cumulative difficulty. Located in the hill range of the Flemish Ardennes in East Flanders, the road is best known for its presence in the Tour of Flanders, E3 Harelbeke & Dwars Door Vlanderen. The lower 600 m of the climb consist of a narrow asphalt road, the upper 1600 m are paved with cobblestones. The first 500 m of cobbled section are particularly difficult, it is the steepest and narrowest part of the climb with a bad, very uneven cobbled surface. Don’t forget to celebrate at the top with a Kwaremont 6.6% beer. Over the last weeks we had the opportunity to spend some (significant) time in beautiful cycling mecca Girona and met the lovely hardworking guys and girls from Eat Sleep Cycle [...] If you are looking for some awesome riding in the Costa Brava or Europe in general, these are the people that can help you. And if you are in Girona, check out their brand new Hub - it is a great place! Hired a bike for the day [...] and did the via verde Girona to Sant Feliu dels Guixols (40 km and you can get the bus back with a bike). Zulma was very helpful with the rental and it’s great they are open Sundays. Bike was in great condition. Would recommend them.